I have a bad habit. I am always trying to match-make my friends. I always wonder, they are such nice friends, why aren’t they attached? I want to see them get married and attend their wedding dinner! So last week, I decided to bring Girlfriend R to meet two of my guy friends for dinner. I used to match make Girlfriend R with another guy friend. But unfortunately, there was no sparks. To save everyone from all the embarrassment this time, I didn’t tell Girlfriend R this is a match making session. All I told her was, these two guy friends want to meet me for dinner but I do not want to go alone. Girlfriend R isn’t stupid, I guess she kind of knew my intentions but decided to play along. Helmed by chef Paik Jong Won, his siganture dish is the Woo Samgyup ($22) – thinly sliced beef dressed with a special marinade. 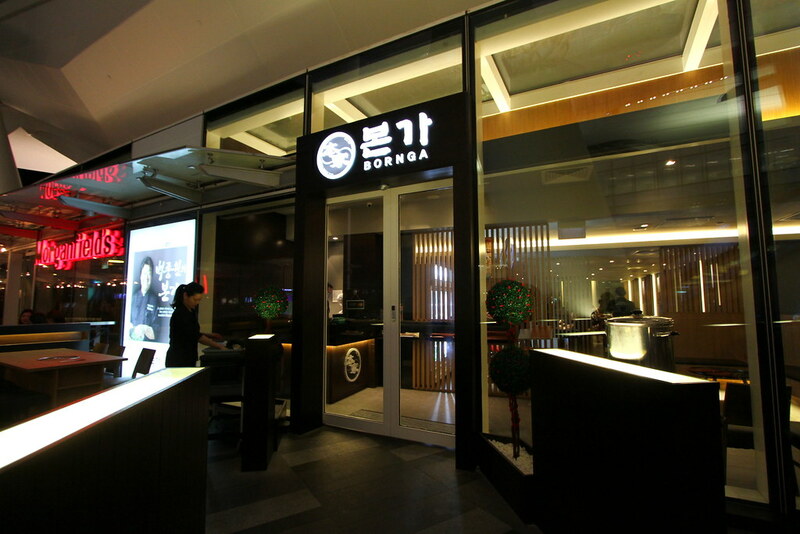 Unlike the typical Korean BBQ Bulgogi which usually appears dull after marinating for at least half a day in a dark-colours sauce, BORNGA’s Woo Samgyup is served shortly after being doused in a unique BORNGA dressing. Using beef brisket that is hand-picked for its beautiful marbling, this light marinade retains the meat’s natural colour, while enhancing the traditional Bulgogi taste. 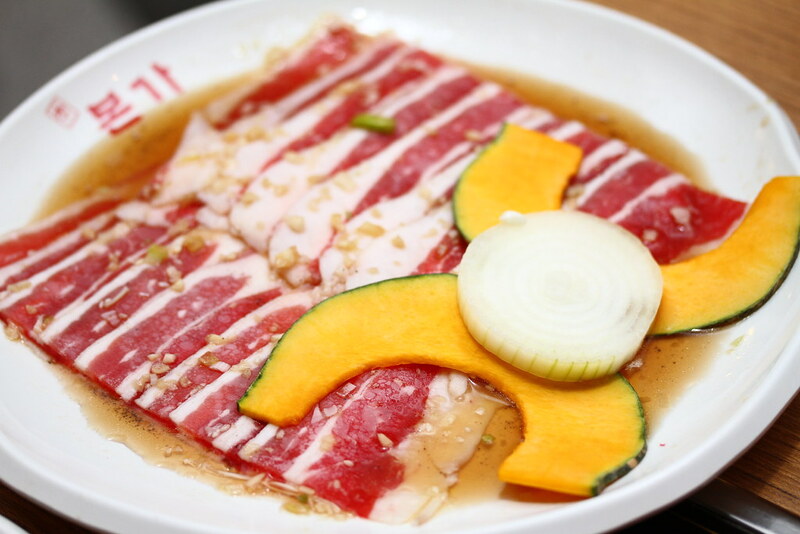 Because the beef slices are very thin, it will cook very quickly. 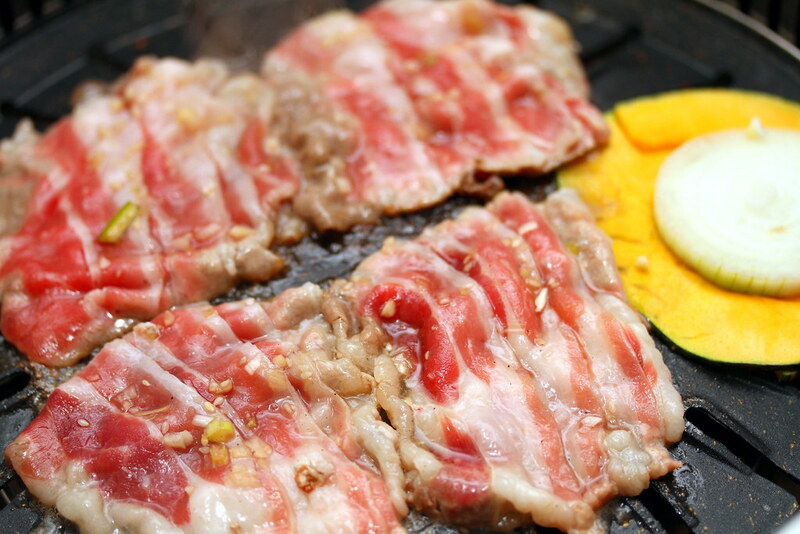 Woo Samgyup is best enjoyed when dipped in the signature Woo Samgyup sauce ($9). This sauce is imported from Korea to all BORNGA restaurants to ensure consistency. 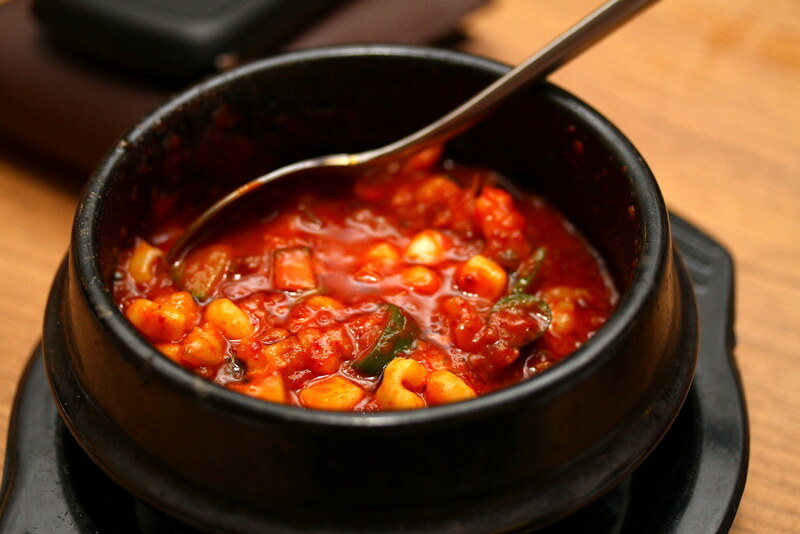 This seasoned soybean paste is cooked with a variety of seafood. You may roll it up with scallions and dip into the special sauce. Then, finish by rolling the beef with various vegetables. 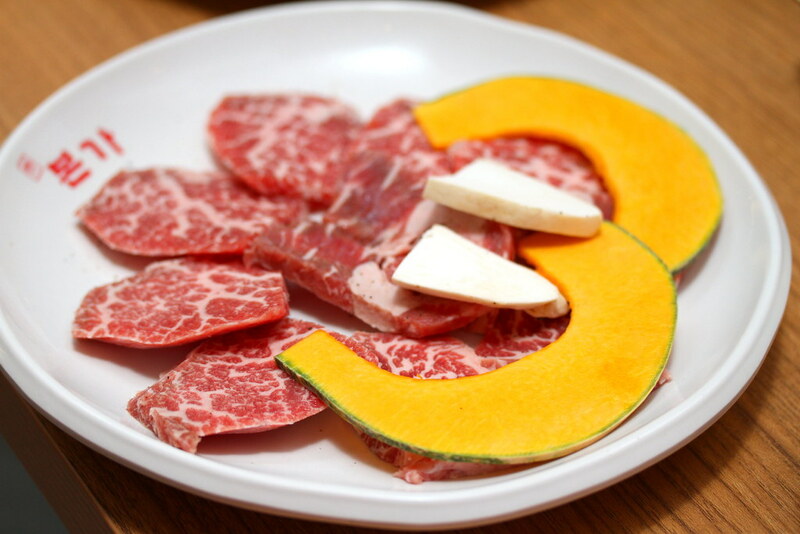 Besides the patented Woo Samgyup, there are also a variety of other BBQ dishes such as Ggot Sal ($38), tender prime beef cuts served non-marinated where we can enjoy the deep beef flavours. The guy friends are non-beef lovers. 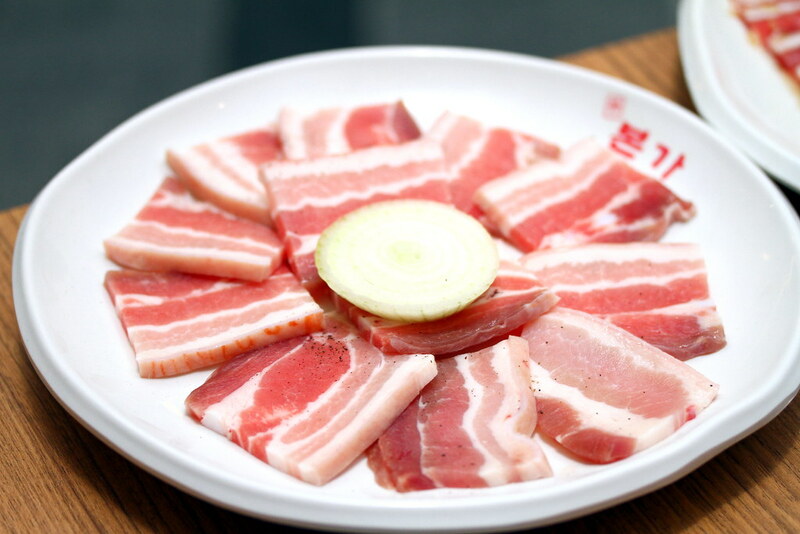 So we also ordered Samgyupsal ($18) which is grilled pork belly. It has the right proportion of fat and meat. Don’t need oil for the grill, the meat gives out its natural grease. 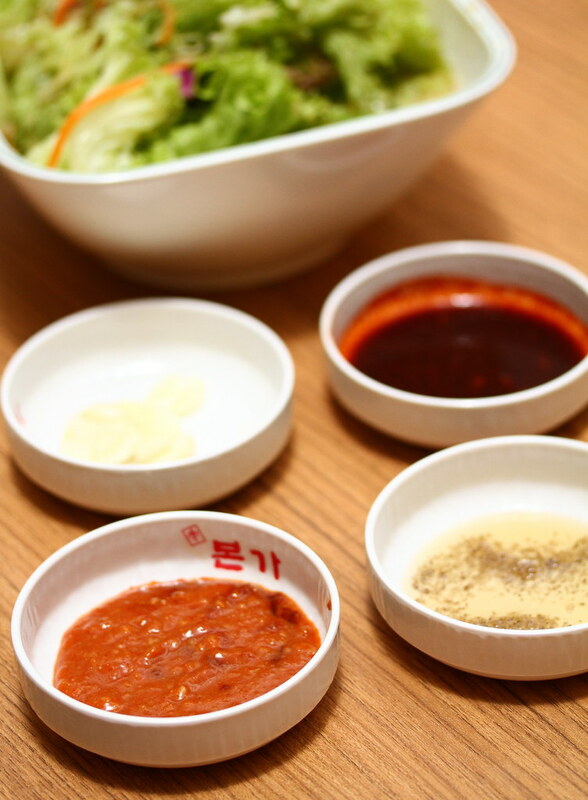 Besides the Woo Samgyup sauce, there are three types of sauces available to accompany the BBQ meats: a simple dip comprising sesame oil, salt and pepper; Korean soya bean paste sauce; and a meat sauce. 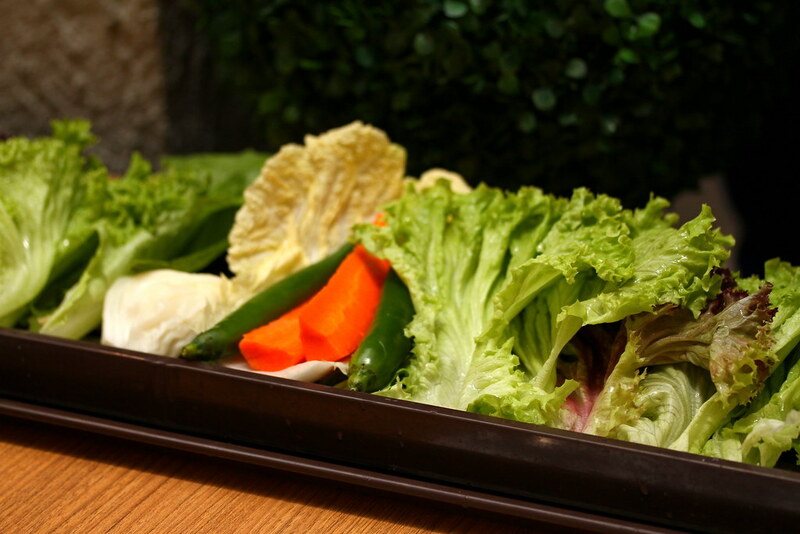 With every meal here, the restaurant serves a long tray of fresh raw vegetables for us to wrap the BBQ meats or kimchi for a refreshing bite. We instantly felt very healthy when this long tray of vegetables arrived on our table. It has got about 10 varieties of vegetables! 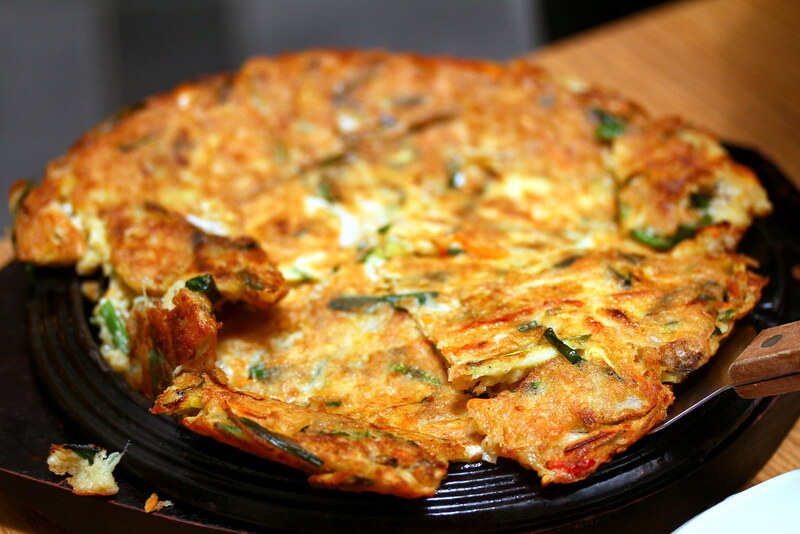 Besides the BBQ meats, we also ordered a plate of Haemul Pajeon ($22) which is Korean pancake made from scallions and a variety of seafood. It is very thick and has generous toppings of seafood. There is accompanying sauce for the pancake, but I like it with Woo Samgyup special sauce. 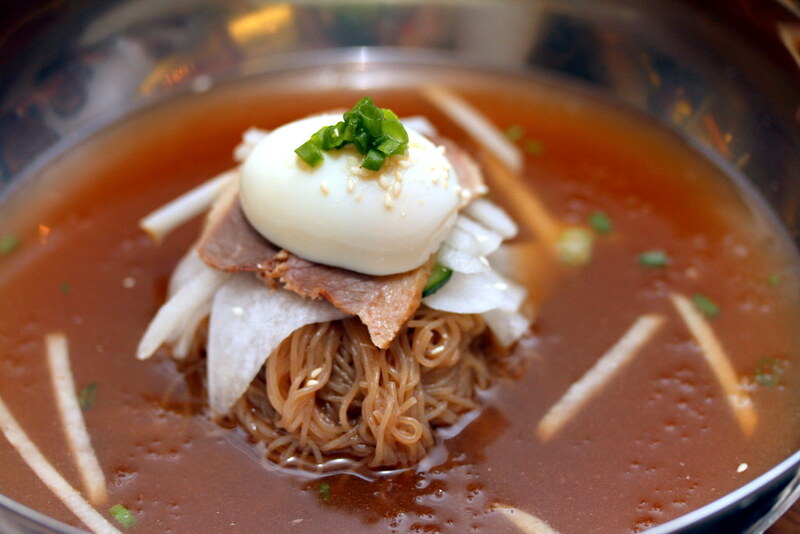 Another house specialty we had was Born-Ga Naeng Myun ($15) which is buckwheat noodles served in cold broth. The chewy noodles are topped with fresh crunchy slivers of pear, slices of cucumber, tender beef, and crowned with a hard-boiled egg. Very refreshing. 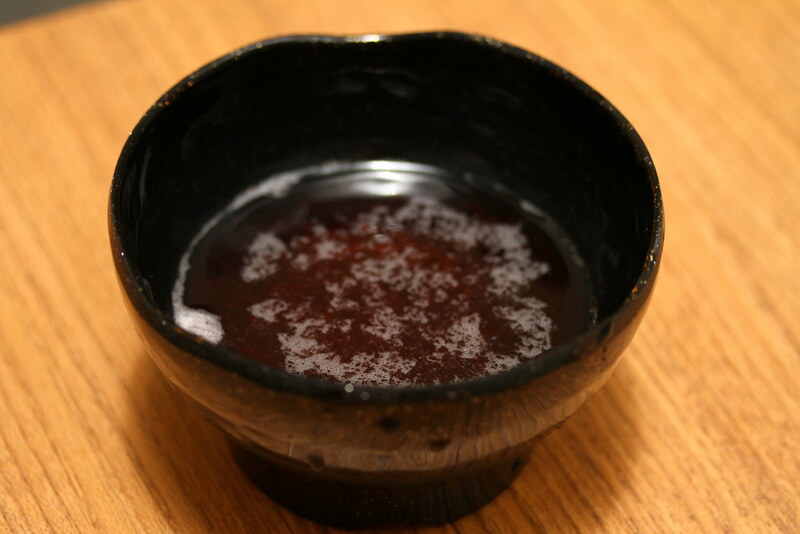 To end the meal, each of us have a bowl of Omija, which is a five-flavoured cold tea which is said to help in our digestion after a meaty meal. The food is not bad especially if you love to eat BBQ meats. But their meats either have very light marinade or no marinade at all, so this is where you can taste the real flavours from the meat. They are opening another outlet in Vivocity soon, so be sure to check them out! The guys played a gentlemenly role by giving us a treat. So did the match-making succeed? Well, I guess I am still better off writing my blog! Let’s build a food community that helps to update the food news in Singapore! Simply comment below if there’s any changes or additional info to Bornga. We will verify and update from our side. Thanks in advance! Srsly this is a place for either raw or overcooked. Totally don’t worth the month. I even have the pictures of those unevenly cooked beef! Let me know if you want to look at the pic.